Top Notch Material: Cat's Pride Litter Makes Having a Kitten a Little More Pleasant! 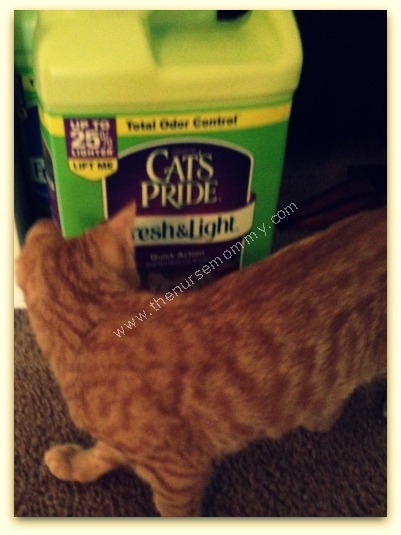 Cat's Pride Litter Makes Having a Kitten a Little More Pleasant! After years of having no cats, we decided to bite the bullet and get this little guy. We are in the country and decided he might do some hunting and keep the critters away. To be honest, I keep trying to get him to venture outside and he will not get away from my steps. My son named him Pizza, and he seems to be a lot like Garfield's favorite food- lazy! Since he is a kitten, I am not pushing the issue and allowing him to be an indoor kitty. Having a indoor kitty reminded me of the one reason I have not had a cat! LITTER BOXES!! This is definitely not my favorite part of having a kitty fur baby. So, of course, when I was contacted to review Cats Pride litter I jumped at the chance. This litter is much lighter than other bags that I have purchased! It also clumps a lot better, so it is easier to scoop! It manages to keep that odor down, and I particularly like the scented variety. 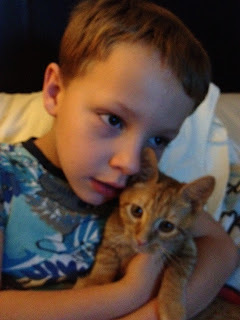 My biggest worry with getting a cat, was odor. I have been many homes that just smell like a litterbox and that is the worst thing in the world to me. Now, with my Cats Pride litter I do not have that concern. I have not smelled any terrible smells in my home, as long as we scoop the litter daily and change it every few days! The other really nice thing about this litter is because it's not the really big granules, I have noticed that my cat does not seem to carry big pieces out his litter box anymore. Prior to using this brand I was hath having to vacuum daily around his litter box, because the other brand stuck to his paws! After learning about Cats Pride litter, and how much lighter it is than other kitty litters- and the affordability of it, we definitely know this is the litter for us!! Great review. I don't have any cats so I know very little about this topic. Thanks for sharing. I was always a fanatic about finding kitty litter that had a lot of deodorizer in it!